Finally we had a signal of sorts yesterday, which has at least given us a clue as to the short term direction for the yen to dollar currency pair, ( other than sideways!!) 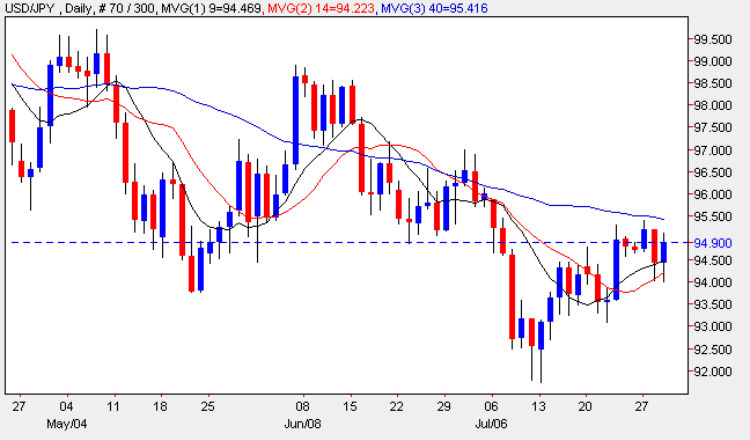 – with the daily candle ending the session as a wide spread down bar and giving us a bearish engulfing signal on the day. Once again the high of the day failed to make any progress higher, and in addition the 40 day moving average added downwards pressure, suggesting that we may now see a deeper move lower in due course. However given the congestion of the last few months, my advice is to wait for this candle to be validated before attempting any trend trades, and I would suggest that a break below the $92.50 price level, coupled with a breach of both the 9 day and 14 day moving averages, should be considered the bare minimum. All the fundamental news on the economic calendar for the US dollar is covered in detail for you in the euro to dollar site, whilst the only item for the Japanese yen was released during the Asian trading session with the Retail Sales figures, which disappointed the markets coming in worse than expected at -3.0%, against a forecast of -2.5%. Overall the figures suggested that the BOJ stimulus package was having little effect in the home markets, with income and unemployment worsening and adversely affecting sales as a result.